With energy costs rising and concern for the environment, more and more people are expressing an interest in building energy efficient homes. Not only are the effects positive from an environmental standpoint, but they can also positively affect the wallet, saving money in heating and cooling costs. 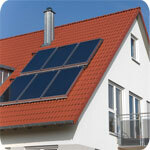 By following a few guidelines in building and landscaping, you can have an energy efficient home. Make use of improved insulation to stop heat transfer through the home. If insulation, that is free of crimping, gaps, and compression is carefully installed it can help keep warm air inside during winter months and cool air inside during the summer. This way you will have much less need of the heater or air conditioner because your house will retain the desired temperature. It will save you money in energy costs. Also, consider high performance windows that are no longer very expensive. Anyway, you will recover the extra cost through these energy efficient windows because they come in improved materials like double glazing and special coatings that act as insulators for the glass. They do not hamper your view through the window, but they stop heat transfer effectively. In addition to using high performance windows, make sure that the window framing is tight and that materials with low conduction are used. These materials include vinyl, fiberglass, and wood. Metal is a good heat conductor, and therefore not a good choice as a window frame. Choose energy efficient equipment to heat and cool your home. You can buy this from many heating and cooling stores. You can lower your bills by using such equipment and save a lot of money and be more comfortable, too. Landscaping is a very important part of building a perfect house. Landscaping features like trees can go a long way on making your house energy efficient. Trees provide shade and cool sorroundings in summers and block chilly winds in winters. Though fully planted trees act as natural air conditioners they can actually help you save a lot on energy costs. You can make your home more comfortable and enhance the air quality of home interiors by making your home energy efficient. This helps you attain lower energy consumption bills that weigh less on your budget. Today's technology and capabilities can actually help reduce unwanted drafts by resourcefully landscaping and building home that efficiently uses energy.